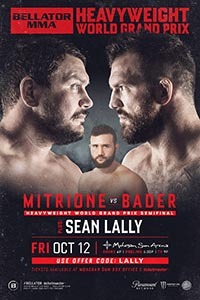 Bellator 207: Mitrione vs. Bader takes place October 12, 2018 at Mohegan Sun Arena in Uncasville, Connecticut. • Kemran Lachinov vs. Sean Lally: Kemran Lachinov defeats Sean Lally via unanimous decision (29-28, 30-27, 30-27). • Matt Mitrione vs. Ryan Bader (HW Grand Prix Semifinal): Ryan Bader def. Matt Mitrione via unanimous decision (30-25, 30-24, 30-25). • Sergei Kharitonov vs. Roy Nelson: Sergei Kharitonov def. Roy Nelson via KO (punches and knees) at 4:59 of Round 1. • Lorenz Larkin vs. Ion Pascu Lorenz Larkin def. Ion Pascu via unanimous decision (29-28, 29-28, 29-28). • Corey Browning vs. Kevin Ferguson Jr.: Corey Browning def. Kevin Ferguson Jr. via TKO (punches) at 2:08 of Round 2. • Carrington Banks vs. Mandel Nallo: Mandel Nallo def. Carrington Banks via KO (knee) at 0:57 of Round 2. • Tim Caron vs. Vinicius de Jesus: Vinicius de Jesus def. Tim Caron via unanimous decision (30-27, 29-28, 29-28). • Janay Harding vs. Sinead Kavanagh: Janay Harding def. Sinead Kavanagh via TKO (cut) at 5:00 of Round 1. • Andre Fialho vs. Javier Torres: Andre Fialho def. Javier Torres majority decision (28-28, 29-28, 29-28). • Sarah Click vs. Kristi Lopez: Sarah Click def. Kristi Lopez via unanimous decision (30-27, 30-27, 30-27). • Alexandra Ballou vs. Lisa Blaine: Alexandra Ballou def. Lisa Blaine via TKO (elbows) at 3:28 of Round 3. • Pat Casey vs. Kastriot Xhema: Pat Casey def. Kastriot Xhema via unanimous decision (30-26, 30-26, 30-26).